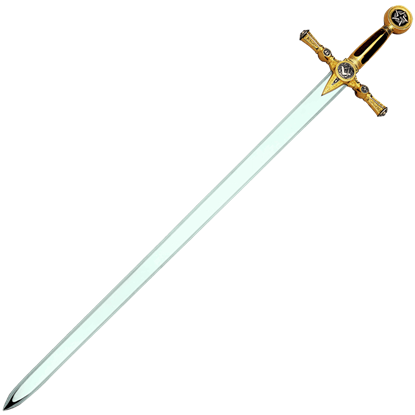 The Masonic sword had several meanings and symbols. The Square symbolizes things of the earth, and it also symbolizes honor, integrity, truthfulness, and the other ways we should relate to this world and the people in it. The Compasses symbolize things of the spirit, and the importance of a good and well-developed spiritual life, and also the importance of self control - of keeping ourselves within bounds. The G stands for Geometry, the science which the ancients believed most revealed the glory of God and His works in the heavens, and it also stands for God, Who must be at the center of all our thoughts and of all our efforts. 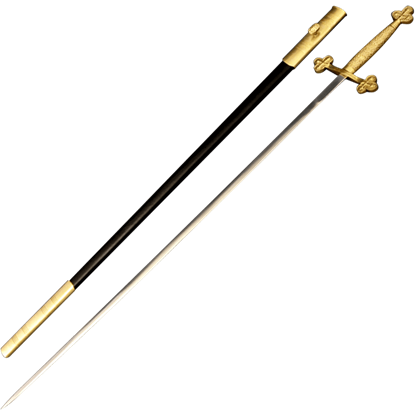 The Masonic sword is a centerpiece of a group called the Freemasons. The Freemasons were a group of stone workers, craftsmen, blacksmiths and architects, that worked for the material and moral improvement of humanity. Their motto, "What You Make, Makes You", succinctly defines their purpose and character. Our Masonic swords can be used for display or for battle re-enactments, each reproduction is created to the specifications of the original. The dimensions and weight are accurate on every piece so you get a medieval weapon that is actually balanced and fun to hold instead of just pretty to look at. Medieval times were sometimes brutal, sometimes romantic, but always a source of intrigue. We invite you to share in the experience of an era past with our collection of Masonic swords. All our Masonic swords are expertly hand-crafted and authentic replicas! You can display them in your office, home or for Medieval Reenactments. Freemasons have been well known for centuries as excellent craftsmen who take pride in their work. 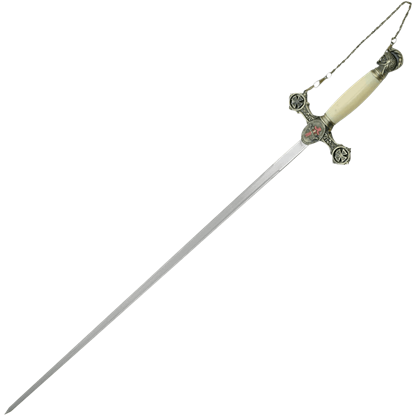 The Black Masonic Sword is a beautiful example of this fine craftsmanship, with exquisite engravings on the blade and the hilt. 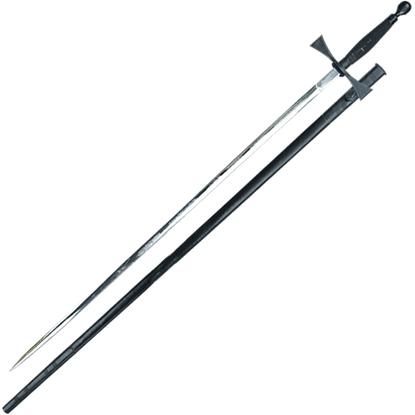 Some swords are ideal for their utility in battle, while some are sought after for their powerful symbolism and beauty. 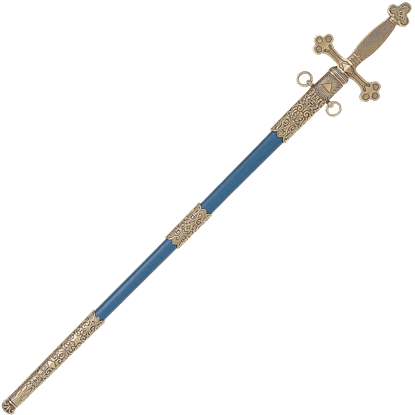 The Brass Cross Ceremony Sword is a stunning display sword, making it a special piece in your collection. The completion of a sacred ceremony requires the proper relics and arms to signify the occasion. 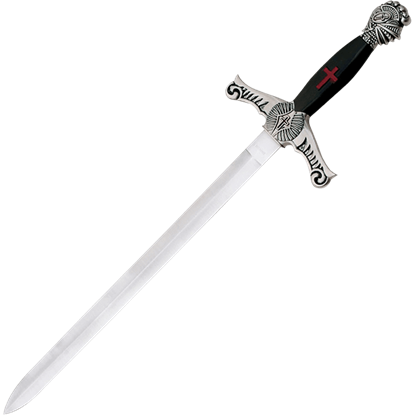 The Masonic Knights Templar Sword celebrates the mystery and symbolism of the holy order that has fascinated the world for centuries. Many knightly orders were founded on the basis of combat, as well as on the basis of brotherhood. Many also developed ceremonies and rituals, and this Masonic Order Small Sword is a thin-bladed sword that stands on ceremony. Even a knight needs a good back-up weapon, so before you venture forth on your quest, make sure you arm yourself appropriately by taking up an impressive blade just like this Masonic Short Sword. The wonderfully designed Masonic Short Sword has an overall length of 20.5 inches. The scabbard is made of metal with beautiful design work done in a silver and pewter finish. The pommel is the knights head and guard has Masonic designs. 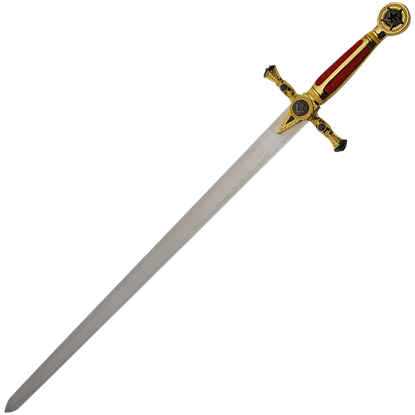 Regal and ornate, the Red and Gold Masonic Sword is an eye-catching sword to add to your collection. Its mirror finish stainless steel blade is matched with an exquisitely ornate gold tone hilt decorated with the Freemasonry symbols. 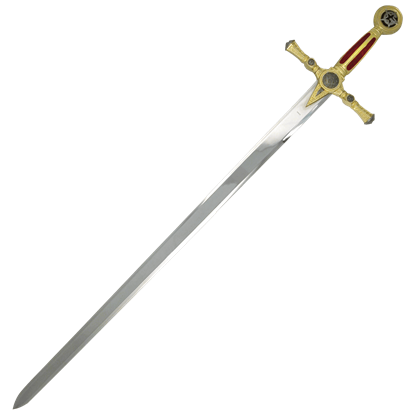 The Freemasons have been around since the 16th and 17th centuries, and while not an official knightly order, that does not mean that they have never used a sword like the Red Masonic Longsword in ceremony and ritual. Throughout history, as an instrument of justice, truth, equality, and firmness, swords have been used at every great event and have become imbued with great symbolism. 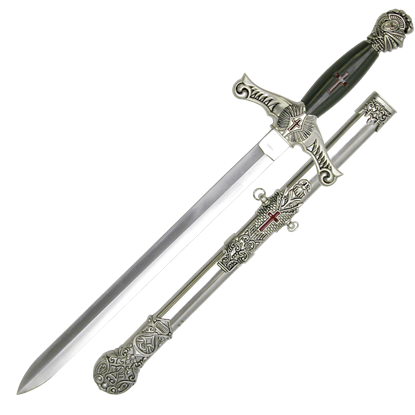 This Silver Masonic Sword is designed for Freemason ceremonies.